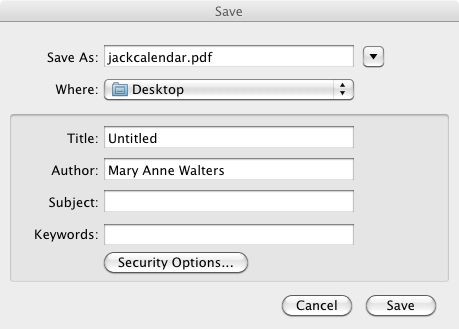 This post is about making calendars using iPhoto and iCal and is only applicable for Mac users. Sorry about that PC folk. I’m going to walk you thru what I think is the most useful and easiest calendar to make, assuming you want to print one at home and decorate it in a scrappy or stampy sort of way. I don’t personally make A4/US letter size calendars, but it came up on UKS the other day and while there were a few replies about Windows-based programs there wasn’t any Mac-response. So I had a play and came up with this. Note: you can use the process to create a calendar that has the photos embedded, then either print at home (oh the INK you will use!) or click the BUY button and order one or more. Now, if you are clever, you should be able to add, for example, a digi-page to iPhoto, or scan an actual layout and just drag that over to your calendar, but I am not going to deal with that now. If you are a digi person, your skills may surpass mine and you will know what to do already. What I am focusing on is very particular – “typical” A4/US letter calendar, blank space on the top half of the page, and calendar at the bottom. I did experiment with recording my workflow as a movie, but because I have a two-monitor set up, one portrait, one landscape, and both widescreen, the results were simply too small to see without heavy editing . So this will be still shots. I am also still on Snow Leopard, but I think this process has only been improved in later versions of the OS. 1. Create an ALBUM with all the photos you want to use. Have this selected. 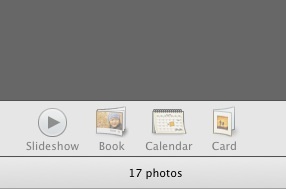 Select more photos than you need for the 12 months – I’ll show you a neat thing with that in a bit! 3. 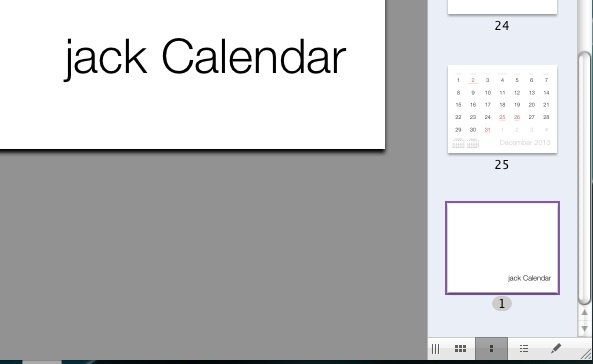 This will bring up a selection screen – CHOOSE your calendar option. Note: anything that appears as GREY will actually print as WHITE, so Colored Paper, or Vintage, for example, are NOT good choices. Modern Lines is leaves faint lines marking the photo position but BIG DATE is good, as is Picture Calendar. 4. The next screen will offer you some options. You can pick the date range, the holidays if you want them to be printed on the calendar, you can add any of your personal calendar bits as well as birthdays from your address book. You will also be able to add info to specific date blocks by typing it in. 5. When you click OK the calendar will come up. 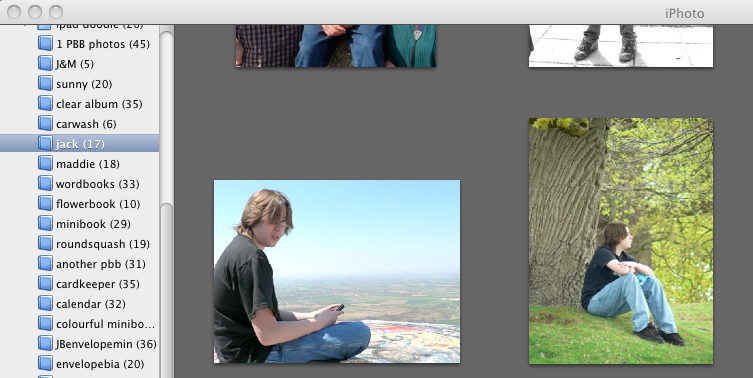 You can drag the photos from your album onto the page IF you want to print the photos. And you can edit the text for the title and subtitle. But about those extra photos… you can also drag a photo on to a date and it will be sized for you. It hides the date but so long as you don’t do a row of them it’s probably not going to matter! 8. Best to save it to your Desktop – I think the default is DOCUMENTS but you will want to use it right away so better it is someplace you can see it. 10. The PDF will be created and saved. It takes a minute. When it is done, double click to open it. See that the first page is the cover? You don’t want it there. Click and hold then drag it to the bottom of the list of pages. 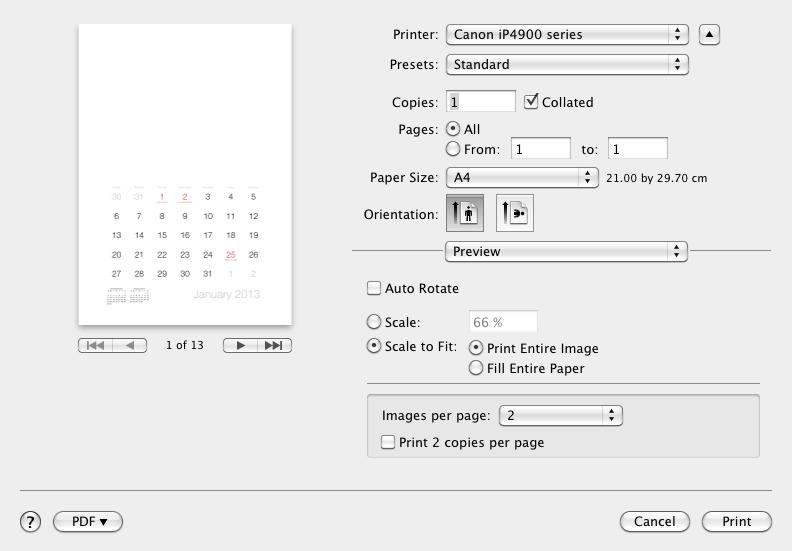 Leave PAGES at ALL if you want to print the whole calendar. You could change the COPIES to 2 or more to print multiple copies at one time – just make sure you have enough paper in your printer! Select 2 images per page but NOT 2 copies – that would give you a sheet of the month block x 2 and then a blank sheet. 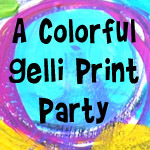 Click the PREVIEW drop down and you can set the paper type (I tend to use Photo Paper Matte for cardstock, but your printer may offer different choices than mine) and if you want the QUALITY (I do HIGH) and sometimes COLOR PROFILE. 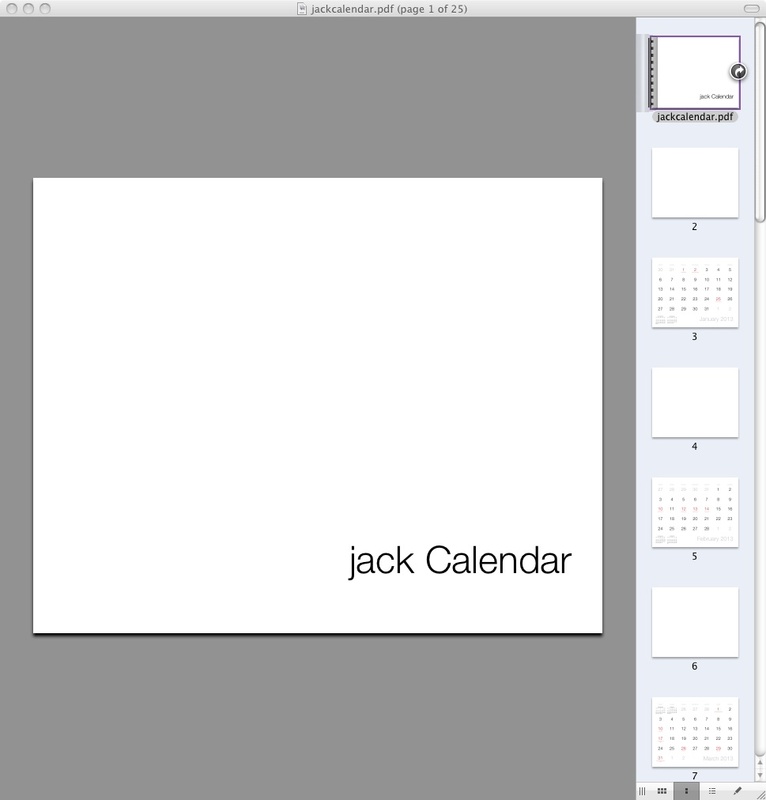 The reason you moved the cover page is that your calendar PDF now begins with a blank page and is followed by the month info. 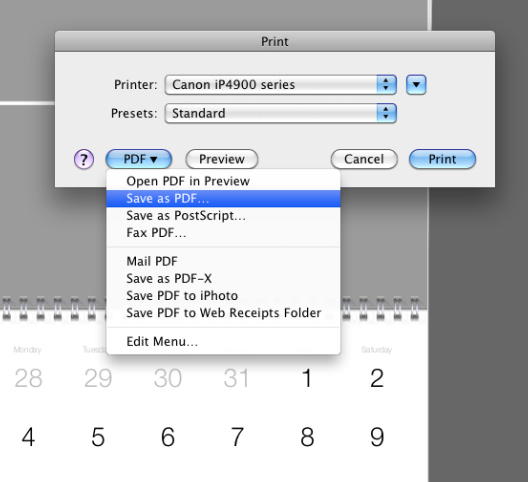 Selecting 2 images per page will print a blank space followed by the calendar for all pages – you can see that at the left in the window. Your cover page will print on its own last. You could then add a photo and print just Page 25 on photo paper for your cover. I am guessing you would do it Pages: 25 to 25, untick 2 images per page, and change the scale to Fill Entire Page. I’d say start there and play with the options to get it the way you want it. Perfect if you want to make a larger wall calendar rather than a CD one. There is LOADS of space to stamp, for example. 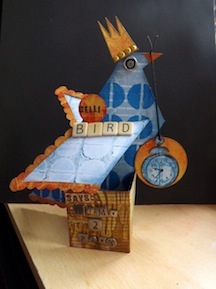 You can build a flat layout on the empty space and make it very scrapbook-y – limited thick embellishments might be OK. You can add printed photos rather than printing them so not so piggy with your ink! 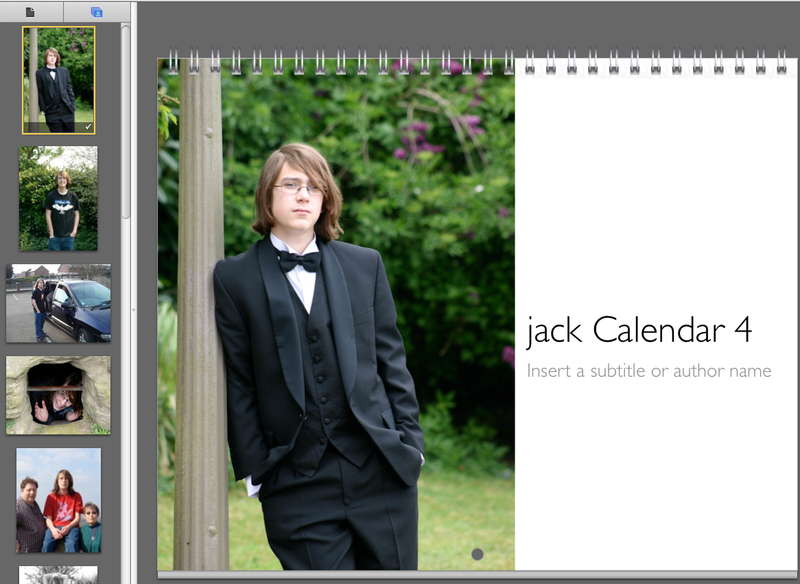 Or you could add photo corners and use them to add a lumpy A5 layout, then remove it when you flip to the next month. It would make a great mini-book at the end of the year, just stick them back to back and bind or add a book ring! Easy to assemble – just use your Bind-it-all/Cinch to add the binding wire at the top – it won’t be a back-to-back page like commercial calendars, but you can accomplish that by printing one page, then turning it over and printing the next page on the back – just make sure you know how your printed handles the paper orientation! You could, of course, edit the PDF in Photoshop and change the month font and colour, or delete the blank pages then print&cut just the month bits to use in a variety of ways. Personally I think it is slightly more stylish than the standard print-a-calendar sites so for me it’s worth the slight extra effort. Plus I LOVE the adding photos to the day blocks and the fact you can customise it so totally. I had the thought that, for example, if you wanted to do a month in review sort of layout, you could print the month, including all your iCal calendars with all your appointments, birthdays, reminders, etc, and have a record of what you did that month. 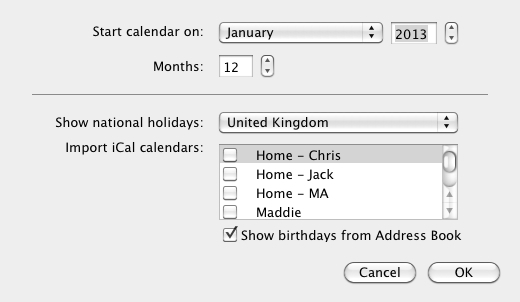 And you can drag in photos for certain days as well and print them right on the calendar. Need it smaller? 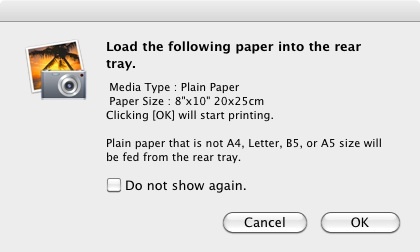 you could edit the PDF to delete all the blank pages and print them 4 images to a page. Really, I think I have only scratched the surface of what you can do with this. 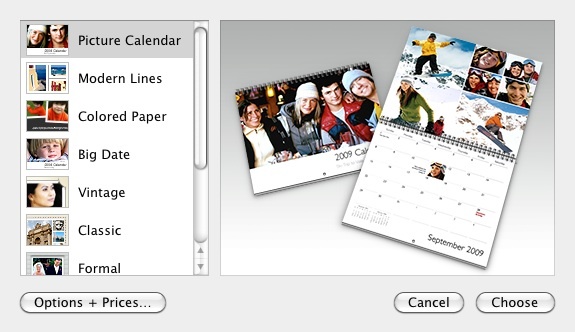 Categories: calendars, technology and scrapping | Tags: Mac specific, scrapbooking, technology & scrapping | Permalink. Thanks for these. I wasn’t going to make calendars this year, but this looks so easy I think I might just make them and let Apple print them.